Norway's wheat production impacted by Climate Change | Watts Up With That? Just a few years ago, Norwegian wheat comprised up to about 75% of Norwegian bread, seemingly hitting a blend wall. Now it is down to 10% due to climate change. Norwegian oil production has produced a classic Hubbert-style peak. Norway will cease to be an oil exporter by 2030. The country had attempted to placate the gods of climate with an expensive carbon capture project at the Mongstad refinery on the west coast. That foolish and self-indulgent project was abandoned on 20th September, 2013. With the funds that have been saved by that abandonment perhaps the Norwegian Government should go back to storing two years’s worth of grain. David, double the impact with a temperature graph and carbon dioxide graph. It would follow figure 1 pretty well. Throw in the carbon dioxide graph to show you need both temp and CO2 for agriculture. If interested in the effect of climate on wheat production, total production is meaningless without an area under cultivation as the denominator. Isn’t this the better graph? The decline in wheat production could have something to do with “eco-food” demand. I have noticed big patches of weed in the fields of wheat here in Sweden, when I do my workrelated roadtrips. Sometimes an entire field is at least 10% weed. It is easy to see what farmer is pandering to to the citydwellers, hungry for “bio-dynamic” food. How much agricultural land is lost to wind farms? I used to buy “sprouted wheat bagels” at my local grocery. They were discontinued by the supplier about six months ago — reason unknown. Perhaps Norwegian wheat farmers need to investigate this potential market. Is it getting warmer or not? That first paragraph is difficult to decipher. People complain about the cold but, OFFICIALLY its getting “Warmer”. Wait a minute, how do they know that the growth from 1% to 75% since 1970 wasn’t also caused by climate change? As Keith says, the wheat yield per hectare is unchanged since the 1980’s. So it looks more like land is being switched to grow more lucrative crops. I suspect biofuels. While I always love a good shot at the doomsday cultists… I would say this has less to due with global warming directly and more to due with the goal of global warming… aka bringing about a socialist utopia. Anyone who knows anything knows socialism create vast waste and under production of resources. Anyone who’s been following the news lately knows that the communism union know as the EUSSR has been gaining more and more control and power over every aspect of europeon life. One of its major pushes is the control of food. It is much more likely that the loss of production is due to socialism then any weather/”climate changes”. You badly need a Norwegian temperature graph if you are saying that wheat production is down because of the climate. here is CET to 1772. Temperatures have been dropping sharply for a decade. We are back to the climate of the 1730’s. My primary concern at this point is the probability of imminent global cooling, which may or may not be severe. In the longer term over thousands of years, catastrophic natural global cooling is inevitable. I suggest that the primary focus of climate science should not be alleged humanmade global warming and its mitigation; rather it should primarily focus on natural global cooling and its mitigation. Clearly, oil production is down due to climate change. The graph says it all! What else has declined in the past 5 years? We’ll blame that on climate change as well. Wait until sun cycle 25 kicks in! Tony B, I may have misunderstood the author of the above article, but I think he uses “climate change” to refer to the 17 years of lack of warming and even cooling since 1996. Thus, I believe your fine data citation supports David’s analysis (and good for you, Tony B). So, yes, Klem, “climate change” (warming due entirely to natural forcings such as ENSO) did help the wheat to grow and, now, is stunting it. AND MORE WARMING WOULD BE A GOOD THING. Yes, Mr. Nystrom, that indeed could be a major cause. “Organic” and/or “pesticide-free” and/or “non-GM” food is a scam perpetrated for profit on the uneducated. Sad. None of my business, yes, until they get politicians to take away my freedom to choose to NOT participate in their fantasy world, WASTEFUL (indeed, Temp), practices. Take care, Allan — your posts over the past weeks (years? — I’m relatively new to WUWT) have established that you have many worthwhile, intelligent, things to share. Sleep well, tonight! Martin M is dead on. While Archibald’s assertions in this article could, with luck be true, unlike the vast majority of his curve-fitting pseudoscience, there is no way to know from the information presented. A stopped clock is right twice a day after all. But let’s do a ten minute analysis while in bed with my laptop. Norwegian wheat production may be down to the land being shifted to other crops for economic or political reasons. Sometimes it’s just cheaper to import one thing and produce another, or perhaps biofuel subsidies made crop switching profitable. There’s definitely been an up and down swing in total grain production in the last 25 years, with a bounty year in 2004, but it looks like the majority of the decline in wheat has just been shifting to barley, oats, and rye. Perhaps for climate reasons, but just as likely for market or political reasons, as grain is not the majority of agriculture in Norway. So who knows what is happening and why? I sure don’t, and I guarantee Archibald doesn’t as well. Paging Tor, personal friend and WUWT reader from Norway, could you weigh in please? I guess I’ll have to send a facebook message. Echoing an earlier comment–total wheat production is meaningless as it ignores total acreage devoted to production, which could have fallen off a cliff. Likewise with oil production; market forces (current and forecast market price) also determine how MUCH oil one is willing to extract. Oil wells (at least land-based; this may or may not be the case with offshore rigs) sometimes sit idle if the marginal profitability of each barrel is not compelling. How competitive is Norwegian oil vs allternative sources? Is Norway using foreign (or domestically) sourced natural gas? It looks like Norwegian grain production is a pretty good proxy for NH surface temperature anomaly. With a baseline near 1965 when it was close to zero. Yet another indicator of a climate turning point in 2005. They try to spin this as due to climate change with mention of excess moisture … read stronger and more frequent flooding … read unattributable climate weirding. If it is due to ‘climate change’ it would seem to be more likely the climate cooling kind. Is it getting warmer or is it getting colder? 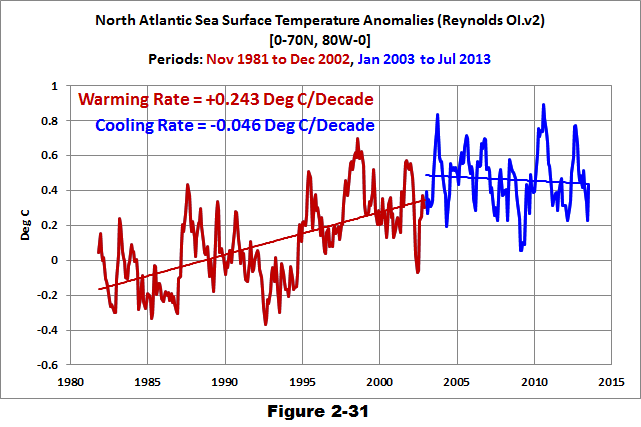 Is there global warming or do we have global cooling? 2 incredibly polar opposite views with the debate, more often than not focused on this and climate and weather. While the most amazing contribution to growing crops related to the atmosphere has been the fertilizing effect in the globally well mixed and increasing CO2. Crops yields and world food production is benefiting greatly. About 85% of plant species are C3 plants. They include the cereal grains: wheat, rice, barley, oats. Peanuts, cotton, sugar beets, tobacco, spinach, soybeans, and most trees are C3 plants. Most lawn grasses such as rye and fescue are C3 plants. Corn is a C4 crop. “At present atmospheric levels of CO2, C4 plants are more efficient at photosynthesis than C3: in absolute conversion efficiency of light energy to stored chemical energy they are around 7% efficient, compared to 4% for C3. As CO2 concentrations increase, the photosynthetic efficiency gap between C3 and C4 plants rapidly closes, and at double today?s CO2 concentration (i.e. at 780 ppm instead of today?s 390 ppm), the photosynthesis rates are the same. Incidentally, the majority of the world?s most troublesome weeds use the C4 pathway, and so have a competitive advantage over C3 crops at current CO2 concentrations. At higher CO2 concentrations, competing for the same resources on the same patch (light, water, CO2, nutrients etc), C3 crops increasing out-compete the weeds. Sprouting is the first step in making malt by creating enzymes that convert starch to sugar. Sprouting on the stem, send directly to the roaster, make mash,add water and hops, boil wort, make beer. It shows the same histogram of % of domestic production as David Archibald’s article, except oddly it terminates in 2006. Data is given for the area under cultivation for wheat and cereals, the absence of historic year-to-year acerages suggests these numbers have not changed substantially. While some loss of production might be caused by land use changes, the fall of almost 50% since 2009 seems highly likely to have a climate component. We know summers have been bad since then. I’m going to Trondheim next week, I’ll ask someone. ………..So who knows what is happening and why? I sure don’t. It is very simple, oil and gas prices have been rising in the last 10 or so years, Norway exports giga giga-buckets of both and getting very very rich. It is far cheaper to import US or Canadian, Ukrainian or ‘wheatever’ than bother with growing its own. @ charles the moderator: Thanks for injecting some coherence into this thread. 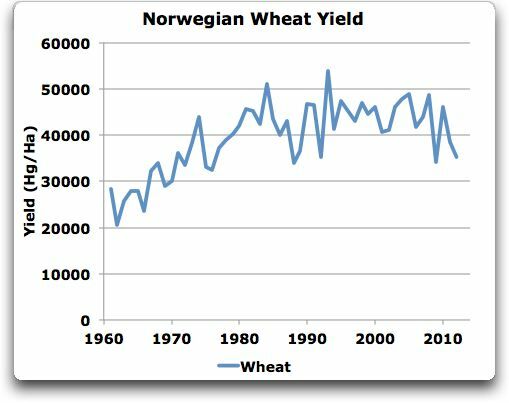 Looks like Norwegian wheat flour production is an excellent proxy for “climate change”. Who needs tree rings! Not identical but a strong similarity. We must act now to tackle climate change. Now, where are those early springs I keep hearing about? It went absent in the UK too this year. …..The main reason for the poor 2013 harvest seems to be the late spring, and in addition the grain acreage in Norway has been considerably reduced, NRK reports. From charles’ link, since last year.. wheat down 50, barley up 50.
sorry, that’s from 2011 to 2012. Increased imports of cheaper EU subsidized wheat, anyone? Norway is not a EU member but preferred trading partner and may profit from importing cheaper wheat from the south which in turn would reduce incentive to grow it domestically. It would also be interesting to see if there is a shift in what farmers put on their fields over the years. Maybe they are now preferring a cash crop? The world record for wheat yield per hectare is held, not by European countries or by North America, but in the southern part of the South Island of New Zealand. And yet NZ, by world standards, grows very little wheat. Despite the yield, the most productive farm land use is usually something else such as dairying and it is cheaper to import wheat from much lower yielding countries such as Australia. Same for Norway. Grow what suits it best. I can’t imagine that that is wheat. Norway is in reality to far North/to Cold for wheat, traditionally we grow barley and some Oats, wheat only on the plots with long seasons. Some special incentives and warm, good summers made more and more farmers take the risk on wheat as you can see from Davids graph. 2007 was a very good year with bumper crops and high quality, later years with less favourable conditions have started a downward spiral with less yelds, less profit and reduced wheat area. Especially autumn wheat is reduced since the harvesting in bad years can be to late for sowing. Norwegian wheat was never really good for flour anyway, baking was so much easier with Canadian or Australian wheat. But building up a few years supply of grains (we still have the silos) as David suggest may happen, it is picking up political momentum now. Luckily we have made a lot of large oil field discoveries lately and the export will pick up over the next 5 years, Also the graph is misleading, we export a lot more gas then oil now and at very good prices compared to the US. The CCS at the Mongstad gas power facility was a sad event in Norwegian politics. Against all technical and commercial advice the project was started for purely political reasons (The green party demanded it as a concession to join the centre-left coalition that ruled Norway for the last 8 years) and it just could’t be shut down as evidence of the financial impossibility of the Project became evident years ago. Yes, global warming is responsible for the cold in Norway and the humongous snowstorm hitting the Great Plains, earliest on record, here in the US. It’s also responsible for the government shutdown and the IRS coimuing after Dr. Ben Carson. The former is sarc, the latter probably not. Panama Red, Acapulco Gold- Oslo Orange, Bergen Blue? That’s a heck of a chart. Run your mouse along the data line. Nice. You have to hand it to the Norwegians (I salute you, Sigmund), once they see something is worth a try, they give it 100%. When they see it isn’t working (after getting herring heads like the “Greens” out of the way), they STOP. NOW. Mankind can indeed change a climate, land use. Was there any deforestation involved with that expanded wheat farm area?. Any new dams in the area? Do they burn wood pellets? Do they make wood pellet?. Any Bio-diesel production? > If interested in the effect of climate on wheat production, total production is meaningless without an area under cultivation as the denominator. Isn’t this the better graph? Both metrics are interesting. A fall in production as steep as this clearly indicates the diminution of suitable land, even though the productivity in remaining areas may still be good. As an extreme example, we know from archaeology that wheat and barley were grown in the north of Scotland, at the elevations around 200 metres and higher, only about a millennium ago. Now there are only ferns and mosses there. It’s not that the present climate is too bad for wheat; it is way too good for the mosses. On a related note, I had been following the wheat-growing effort in Iceland (just by flying over it) until last year, when I knew it was snowed in in the first days of September. I wonder if the effort is still ongoing. Norway is small player in the global cereals production market and despite bad crop years in various places overall global production will be up 8% this year. Wheat production and stocks will be lower. At 2 489 million tonnes, FAO’s current forecast for world cereal production in 2013 is marginally lower (3 million tonnes) than reported in September, mainly reflecting poorer prospects for the South America wheat crop, following adverse weather. Despite the adjustment, world cereal production would still surpass the 2012 level by nearly 8 percent. This significant growth is mainly the result of an 11 percent anticipated expansion in coarse grains output to about 1 288 million tonnes. The United States, the world’s largest maize producer, would account for the bulk of the increase, as it is expected to harvest a record maize crop of 348 million tonnes, 27 percent higher than the previous year’s drought-reduced level. I use the ripe tomato index here in Tacoma Washington. It has been 4 years since I was able to ripen any of the larger tomato varieties. My friend In England has also given up on large tomatoes as well. Fersk roget laks med flodesuvet spinat at The Lighthouse, my favorite (Norwegian) diner. I hope it was all you happily anticipated as you zoomed up the highway. Good? (btw — what in the world did you eat? My guess is salmon and spinach soufflé). Well, at least the Norwegians were smart enough to invest their oil money wisely, instead of squandering it. Are you certain what’s so “clearly” seen is what in fact’s the case? There’s details, source and background in the comments here above. @Keith DeHavelle: Yes, I take it back. I can’t really judge how suitable the land is for wheat based on total production figures — thank you for pointing it out. But if we’re now in a situation when other crops give wheat the shove, and if the trend continues, won’t it be reasonable to expect that eventually there will be areas where weeds have given the shove to the last profitable crop? A more generalised version of the point I was trying to make is that each crop is subject to competition by other crops and wild plants. It is possible that the climate can affect the outcome of such competition more than it affects the crop’s yield. Or, in other words the missing bit of information here is how much does it cost to maintain the present yield and how much does that cost vary. As Willis showed in his graph the wheat yield did not decrease significantly during that same period, but from March of 2008 until June of 2010 the price of wheat dropped from $439.72/metric ton to $157.67/metric ton (http://www.indexmundi.com/commodities/?commodity=wheat&months=120). Farmers don’t grow crops which won’t make them money regardless of what the climate does. At least your posts could then possess some redeeming quality or social value as opposed to the continued detritus that simply continues to pull down the credibility of this site. We’re still in the early stages with unconventional fuels. As Charles C. Mann articulated in his story for The Atlantic: “we will never run out of oil.” Now, “never” isn’t the word I would choose, but in the time scales that we’re concerned with (years, decades, centuries), I’m inclined to side with Mann: there are plenty of fossil fuels in the ground (and under the sea if you consider methane hydrates). Before long, unconventional fuels will be considered conventional. And we haven’t even tapped into what’s recoverable with heating actual shale deposits for fuel. (STRANGE CONCLUSION?) The decision is ours then, not on geology or other natural constraints. It’s up to us to craft policies, develop trade agreements, or implement technologies that keep us within our carbon budget in a period of fossil fuel abundance. Ministers are under renewed pressure to scrap their controversial green “carbon tax” after delays in European Union state aid left British heavy industry without promised protection from the costs of the levy. Tata Steel and BASF have warned that the so-called carbon price floor — levied on fossil fuels used in power generation — is putting them at a competitive disadvantage. The Government promised that energy-intensive industries would be offered a £100m compensation package to protect them from the unilateral tax, which was introduced last April. But the compensation has been held up for several months awaiting EU state aid approval, with businesses already facing millions of pounds in costs. .. If approval were rejected, it could call the whole tax into question. Industry hopes that the Government may be prompted to review the tax, especially after the Conservatives indicated that they were looking to mitigate rising energy costs in the wake of Ed Miliband’s price freeze pledge. Andrew Mayer, head of UK public affairs for BASF, the world’s leading chemical company, which employs about 2,000 people in Britain, said: “Without clarity on state aid approval for energy intensive rebates from the CPS [carbon tax] we are facing a 5pc rise in our energy costs today and 20pc from April 2015. The carbon tax was originally intended to encourage new low-carbon power plants such as wind farms and nuclear sites by making it increasingly expensive to run coal and gas works that emit carbon. Until then, many delegates will look back fondly on their time in Quebec’s largest city. Talks were brightened by an average of three cocktail parties per night hosted by different countries, some of whom were angling to win a coveted seat on ICAO’s 36-member governing council. The committee agreed to “develop a global MBM (market-based mechanism) scheme for international aviation” in 2016, as decided by the ICAO’s governing council in early September. Europe wanted the ICAO to help shore up the continent’s ETS, which is central to its climate policy and requires all airlines using EU airports to pay for emissions. Analysts say the European Parliament could reject the Montreal package, but would have to act quickly to endorse any extension of the European Commission’s decision to “stop the clock” on its law in time for an April 2014 deadline. Some environmentalists felt let down by the outcome. Friday’s agreement lacked the “guts” that the environmental community has been looking for from the aviation industry, said Bill Hemmings, program manager for aviation and shipping for Brussels-based environmental group Transport & Environment. “After all was said and done, much was said and not much was done,” Hemmings added. More curve-fitting than you can poke a stick at. What’s happening with Norwegian wood? Roger, John lit a fire. Isn’t it good? Once upon a time in Sweden and elsewhere in the Nordic countries bread made using the ground bark of common trees … during the 18th century Carl Linneaus once described during his travels the dire situation of forests which could not survive the widespread debarkation … Today science is discovering that there are clear health benefits … So, bark bread, in particular birch bark is suddenly back in again … . I typed “bark bread” (in English) into Bing and several sites came up. Interesting. I think you would need a TON of butter and honey to make that stuff taste good. There is NO sugar/sweetener and NO salt in the recipe. I’m not going to be making that …..unless I have to. Thanks for sharing, though, O. H.. Remember this guy? LOL, “… cattails. Yes, they’re edible.” Who knew? WHO CARES! Yeah, I suppose we (in the U.S.) all will if we don’t rescue our economy from the socialists in D.C. pretty soon! Hey, it will be a win-win — Dopebamacare will ruin our wonderful dental care industry…. but, waf out woud! We wone naffenny teef! Cute, Mr. DeHavelle, lol. Applause. P: My bweh iff ah my pwafe! P: Aaa my teef ah ih my bweh!!!! W: Ah, well, we did explain to you, did we not? Here (points to tiny print at bottom of menu). “Eat Norwegian bark bread at own risk.” Now, how would you like that steak done? Do you think you would like Ingrid’s bread? Your work on energy production and consumption may be interesting. I’m not interested enough to dive in and analyze, but it does look like a useful compilation. I’ll just point out when I see something silly, such as your post here today, or your cancer/pho schtick. Ah, my Norwegian ancestors, once know as the ‘Berserkers’ once the scourge of Europe, discoverers of America, now give peace prizes to terrorists and blow thru their inheritance in less time than it takes to collect same. 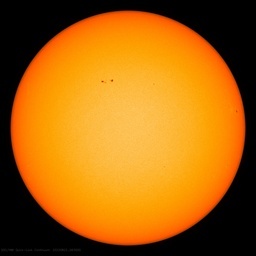 O note, they did not have much production to speak of during the weak, flat sunspot cycle of 1965 to 1976. I appreciate the article. I verified some of my observations over the years with good numbers. What is happening to Norwegian wheat production and why, no idea, either from the article or the comments. And does it really matter? However, the 4 horsemen piece linked by DA is quite interesting. He is suggesting a scenario in which there is a combination of global cooling and a fall in energy production combined with a continued rise in population. The cooling leads to a fall in food production in absolute terms and even greater per capita. The result is forecast to be war and famine. One interesting aspect of this is that Climatism forecasts something similarly apocalyptic from warming. A fall in food production, famine and wars. The Climatists because of their preoccupation with CO2 and warming do not pay much attention to peaking fossil fuel supply, other than to make usage decline. But the effect will be the same – decreasing energy use from conventional sources both in absolute and per capita terms. Other causes are invoked for disruption, particularly global flooding. But desertification in the Climatist case leads to a similar fall in food production. The thing you come to looking at both scenarios is that energy use is the key driver. If energy supply falls and prices rise, and if at the same time we have disruptions to food crop production caused either by warming or cooling, then there are going to be very significant global instabilities and suffering. Energy availability is the key here. Whichever way it turns out, and even if temperatures simply stay more or less static at the levels of recent decades. Energy supply is the elephant in the room here. Since when has weather not played the major role in farming? Biggest problem in Norwegian food production, is that we are now giving 3-4-5-6 times the subsidies to “eco” products, in which they do not use artificial fertilizers or herbicides.. The efficiency is a corresponding 1/3-1/6 of that of conventional grown yields. In addition to this, we do not grow the “right” products, that is, products suited for our climate. ( please, do not start criticizing subsidies, that is another discussion). And in connection with our oil: We are one of the riches countries in the world per capita, and yes, only the vast middle class pensioners will get to enjoy this period in our history fully, this is as good it gets. That said, fossil fuel will be THE income of Norway for the future also, probably hundreds of years. All our other exports are just peas in comparison. I think the analysis of Archibald is flawed, and a result of finding what one wants to find..
You really have something here – now that global temperatures are cooling, piracy is on the rise again! Or maybe its the Flying Dutchman on vacation? Clearly there are not many farmers commenting here. Look, I don’t think you can do ‘trends’ on one year. After all, here in the UK, we have just had one of the warmer, drier and sunnier summers in the past 50 years. It came on the back of 5 miserable, wet, cool and damp ones…..
Well, not much wheat in the LIA, no. The French revolution began with protests about the price of bread, after repeated failed harvests. The King begged farmers and people to switch to potatoes and turnips (as had the English and Dutch), but the French were too chauvinistic and culturally rigid to change. They still are obsessive about bread, in fact. Norway’s sovereign wealth fund is now $750 billion ($150,000 per person) and it is growing by $1 billion per month. Why grow wheat (in a rocky cold place) when working in the oil industry or living off the government is more lucrative. Also, Norway had a very cold winter and a very late spring this year, much like most of the northern hemisphere. With a short growing season, many farmers would have opted to grow something else. A good post, thank you Michel. You say “Energy availability is the key” and I agree. Imminent natural global cooling also appears probable. Some of my concerns about energy supply and imminent global cooling are included below. It concerns me that our leaders are still obsessed with fictional humanmade global warming in a (probably) naturally cooling world. I (we) predicted global cooling starting circa 2020-2030 in an article published in 2002. If anything, we may have been a bit late in our prediction. At the time, SC24 was predicted to be robust (Hathaway et al) and it is a dud. SC24 now looks similar to a Dalton Minimum. Regrettably, European leaders have damaged their energy systems through their ill-advised reliance on grid-connected wind and solar power. My concern is global cooling and harsh winters, particularly in the UK and continental Europe, where Tony Blair and his Euro-cohorts have severely damaged their energy systems through the foolish adoption of “green energy” schemes, which have caused electricity prices to soar. I refer specifically to the politically-enforced, highly-subsidized implementation of impractical grid-connected wind and solar power schemes. I understand the “excess winter mortality” in the UK is about 35,000 people per year. This is reportedly due (in part) to fuel poverty, also called “heat or eat”, where people, particularly seniors, cannot afford to heat their dwellings and many huddle in their beds through the winter to keep warm. Fuel poverty is also commonplace across Western Europe, again thanks to green energy nonsense. Falling sea surface temperatures in the North Atlantic suggest that Europe is starting to cool, and there is an increased probability of more severe winters. I strongly suggest that it is past time for British and European governments to face climate and energy reality. Europe is probably cooling, not warming, and these governments needs to discard their foolish notions of global warming alarmism and address the real problems that are facing their citizens right now – fuel poverty in a cooling winter climate. Current government global warming alarmist policies are apparently exacerbating the rate of excess winter mortality in the UK and continental Europe. The original article does not go into enough detail, but perhaps those focusing on yields are missing the point. It does not matter how many tonnes per hectare you get if it is too wet and cold during the maturation and harvesting stage. Then the wheat still gets harvested, but much of it is downgraded to animal feed. Which makes all the intensive livestock farmers very happy for that year, but does not do the wheat farmers any favors. Been living in Norway for the last 30 years. This year, after a late spring we’ve had a fantastic summer now turning into a very colourful autumn. First frost here in Asker was 10 days back so it could be a long cold winter again, at least the skiing will be good. One interesting observation related to this article, for many years there has been a relationship between Norwegian wheat production and bread prices. More home grown wheat gives higher bread prices as, as has been pointed out above, Norway is not a country that is ideal for wheat production. After about 15 years managed to start appreciating Lutefisk (dried cod, soaked in caustic soda, then washed out and baked in the oven, accompanied by bacon, potatoes, mashed peas, brown cheese, mustard and washed down with beer and aquavit). Even better to eat, but it can smell worse, is Rakfisk (fillets of fish that have been allowed to go rotten but in a controlled anaerobic environment), again the beer and aquavit helps. There are lots of Climate Realists in Norway with our own organisation (www.klimarealistene.no) but virtually no public discussion or political climate realism. After the recent election the newly elected right wing parties appear to be even keener on showing how green they are than the ousted socialist cooalition. Luckily there is much more oil and gas out in the seas round Norway, with a significant increase in discoveries in the last 3 to 4 years. There will be work in the offshore industry to see me into retirement and probably my children too! Onshore hydroelectric production continues to supply all of our internal energy needs so the hydrocarbons can be exported to customers in Europe or further afield and keep the Norwegian investment fund growing. Losses due to grains sprouting before harvest are due to rainfall on mature grains – not necessarily particularly prolonged or unusual rainfall, but sufficient to keep the grain moist and the straw wet enough to keep the combine away. A week or so can be sufficient. It’s not at all unusual for crops to be impacted this way in the UK – we measure the impact of the alpha-amylase enzyme produced by sprouting and characterise with a Hagberg falling number – essentially a measurement of porridge thickness. Any wheat acceptable for bread has to have an adequate falling number. More to the point, Norway is a bizarre place to grow wheat – its yields are a tiny fraction of nearby countries – in the UK we typically harvest 2 or 3 times their feeble 4 tonnes per hectare – we can grow it better, more cheaply and don’t have much of a problem loading it into ships in Scotland and floating it over the North Sea – why do they bother? If the MUST grow grains in Norway, rye or even food barley are much more resilient – wheat is just a daft choice of crop. Clearly, much acreage of wheat must have been taken out of production for the total produced to have fallen so far, while yield didn’t drop as deeply. At least some part of the acreage reduction was because of weather, not just converting to other crops or fallowing for some market or political reason. Since the better-suited, higher-yielding land would have preferentially been kept in wheat, yield per hectare held up better than total production. Most of Norway is marginal for wheat & rye cultivation in many decades, with barley & oats often being more suitable, or non-grain crops. IMO a case can be made for a weather component in the Norwegian wheat data, if not indeed a warming climate (30 years’ average WX), followed by a cooling one. In 1980 rains caused some Pacific NW soft white wheat to sprout. Normally farmers would have sold it to Iran, where sprouted grain bread is favored, but couldn’t because of the embargo over the hostages. Nevertheless, many supported Carter’s actions, feeble & ineffective though they were. This bit is technically incorrect. Norway instituted a sovereign wealth fund for the proceeds of oil extraction, so as to stop it wrecking the rest of their economy. They have never taken direct income from their oil. Where did you get the data for these graphics…?